More and more people are using the dishwasher for doing the dishes, and the proportion of such consumers is increasing every year. Therefore, Mayeri is also focusing on the development of dishwasher products’ series, and will bring to the market a dishwasher gel with EU Ecolabel. The dishwasher tablets with Ecolabel are already on sale in stores. Environmentally friendly content – Mayeri’s products for dishwashers contain components that are environmentally friendly. Thereby, Mayeri’s dishwasher tablets and gel have been recognised with EU Ecolabel certificate. Saves the water – when doing the dishes with dishwasher, you use less water. Less garbage – in comparison with regular products, Mayeri’s products’ packaging use fewer packaging materials per wash. Additionally, the dishwasher tablets cardboard box is made from 100% recycled cardboard material. High quality – Mayeri’s dishwasher gel and tablets are high quality products which contain detergents, rinse agents and glass protector. Mayeri recommends the consumers to prefer the dishwasher gel for washing the dishes, as in comparison with dishwasher tablets and powder, the gels have a better solubility. The main problems are caused by dishwasher tablets with water-soluble plastic, as the plastic might not dissolve in water entirely, leaving residues in the dishwasher, which will shorten the life of the dishwashing machine, may cause clogging of pipes, breakdown of the machine, etc. Additionally, the consumer is able to choose the amount of dishwashing gel used in accordance with the amount of dishes and their degree of dirt. However, it is important to follow the dosage instructions on the package in order to avoid over- or under-dosing. In case of under-dosing, the dishes might not get clean, and, in case of overdosing, a bigger amount of chemical residues have a negative impact on the environment. 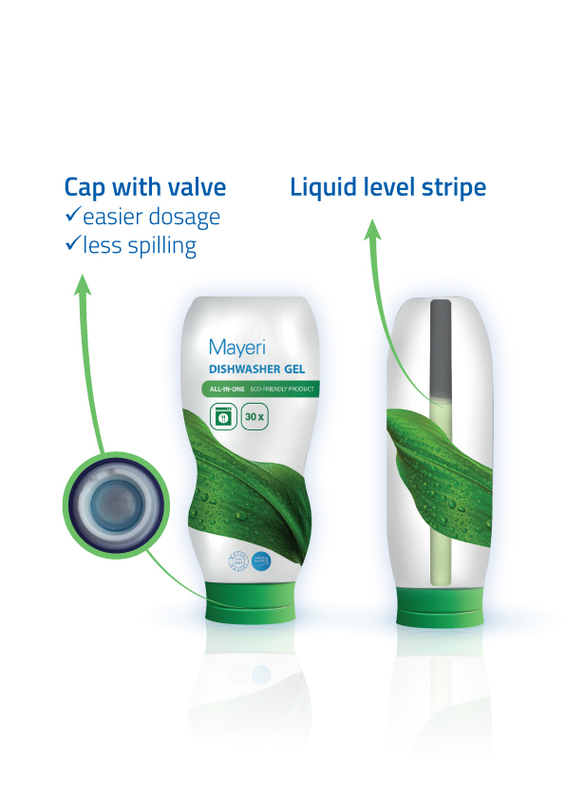 Mayeri’s dishwashing gel is packed in a convenient package. Thanks to its membrane cap, it is very convenient to dose the product, and the amount of remaining product is very easily checked from the level line on the side of the package. The dishwasher tablets don’t have the opportunity to choose the exact dosage. The tablets are highly concentrated dishwashing detergents and the regular practice is that regardless of the amount of dishes and their degree of dirt, people always put one whole tablet in the machine. If the dishwasher is half empty or the degree of dirt of the dishes is low, then it means over-consumption, which is very costly for both the environment, as well as the consumer. We started to use the 500 ml bottles instead of the earlier 450 ml bottles. The company started to produce the bottles of 500 ml dishwashing detergents on their own, reducing thereby the pollution caused by transportation.